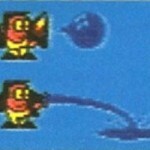 Alligata produced quite a few classic titles and shot certain developers like Tony Crowther to fame. Towards 1986, and sadly Alligata was to be no more, and so it was laid to rest. In 2005, James Grayson loaned GTW a batch of 40 disks which were Alligata master disks sold at a bootfair in Sheffield. 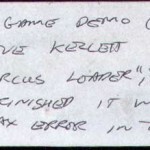 On one of these disks was a bugged and early preview of a game called “Circus Fun!”, produced by Stephen Kellett who did other games for Alligata and later Players as far as we are aware. After some rather nervy disk conversion from a dying disk, we managed to get all of the game ported across without fail and got the thing running. It is a miracle that the demo disk has survived, and this could be the last remaining copy of the game. GTW has luckily salvaged and saved it for people to see. What you’ll find is a very early, and sadly quite bugged clone of Bigtop Barney (Or Circus Charlie by Konami as its better known in the arcades…). The game consists of controlling a clown on top of a lion who has to jump through hoops of fire. There are money bags, which you would think are collectable, but these actually kill you if you collide with them. It was hard to progress far into the game, mainly because of the poor collisions and the bugs. One fatal bug seems to be when you lose 2 lives, and the game gets stuck in a never-ending loop. Thanks to Jaymz Julian, we were surprised to find that the game is not just a one level preview, but there is infact much more here than meets the eye. In total, there are 5 levels which match the arcade game Circus Charlie. Unfortunately, the game is so bugged that you will have to freeze at regular points like Jaymz did to actually reach the later parts. Thanks to Jaymz we can present screenshots of how the game looks at each level. Although we haven’t seen the later levels, from Jaymz account of the game, we can see that if the game was bug fixed, we’d have something rather nice here. We hope that in the future someone will be able to take a look at the game and fix it for people to enjoy. Some story behind the game, Alligata commissioned Stephen to produce the game for them. However, after pretty much completing the game – Alligata didn’t like what they saw and cancelled the release. Stephen sadly never got paid (See full story in creator speaks). Alligata shouldn’t have really kept hold of the game, but it is lucky they did! So we learn of how the game came about, and us discovering it seems to have been a pure fluke really. A chance that Alligata kept all their disks. But it seems there could be a better version available, including even a music score. Steve has promised to check his disks, as he probably still has the sources. “They invited me to Sheffield, took me to an arcade. “can you do that?” – “I’ll give it a try”. Gave me some money to play it for a while. Went to a music shop, bought some music books with pictures of circuses on the front (yes, really). Got Dave Weaver to do the music (does your version have music?) as back then I couldn’t read musical notation. It wasn’t released because they didn’t like what I did. I can’t say I was surprised. For what it is worth, Alligator should never have held onto a copy of that game, as it is not/was not ever theirs. It is my opinion the worst piece of software (of any type) I have ever written. Truly awful. I wasn’t motivated when I wrote it, I didn’t really like the game, only saw the console once for about 30 minutes… I guess I was about 19 when I did it, very unhappy with life, etc, etc. Its written in 6502 assembler using the Mikro 64 assembler cartridge from SuperSoftware (I think from memory, who were based in Harrow? London). As something that is comletely un-representative of what I was capable of doing back then, Circus Fun is it.